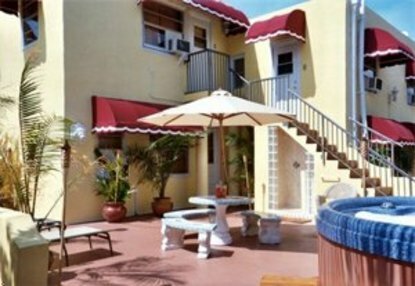 Villa Sinclair Beach Suites and SPA is a 1940 Spanish mansion converted into 6 luxury Beach Suites, fully equipped, 550-800 sq ft and very well appointed. We are located just 150 feet away from the Hollywood Boardwalk and the Beaches and within walking distance of over 60 restaurants and shops either with direct access on the beach or on the intra Coastal. Villa Sinclairs Suites feature Flat Screen 25TV, DVD & CD player, Phone, Fax, Answering service, Caller ID in suite, Unlimited Local and USA Long Distance at a charge of 15 USD per stay, Complimentary Fast Internet Access, Full Kitchen, Mini Bar and Bath, Complimentary Coffee, Tea and Creamer, Room Service by Cafe Safari, Complimentary Welcome Pineapple, Chocolates, SunCream, Beach Towels and Complimentary Beach Parking. Our property features a Lavish 3500 SQF Tropical Garden and Patio, A Cedar Sauna Health SPA with CD player and relaxing Music, A Hot Tub Vita SPA for up to 6 persons, An Outside Marble Shower, A 2 Persons Hammock, An Outside Stone Barbecue with CD player with lounge CD music, an Outside bar, a Fridge and ice maker, 4 lounge areas with chairs, 3 tiled tables and benches with Umbrellas, An Outside Massage Gazebo Massage therapists on call, Victorias Secret Body Lotions and Body oil available in each suite, Bar and SPA boutique in each Suite, Outside Tiki Torches with TIKi fuel always ready for your intimate evenings, A laundry room with Washer, Dryer, iron Board and Iron, A Press room where you will find all the latest complimentary Womens and Mens magazines, Parking facility in our lot or with Street passes. We have Massages therapists on call that will give you a variety of Massages, Facial Massage, Full Body Massage, Stone Massage, Swedish Massage and more either in the comfort and privacy of your suite or outside under our Massage Gazebo. Take advantage to learn how to give massage to the person you love.... Relax, Breath, forget the time, you are on vacation.